Bluetooth proximity devices are a dime a dozen, but Gatekeeper GK-Chain offers something more. Other than the usual tracking of valuables offered by the likes of Protag, the GK-Chain automatically locks your Windows or MacOS computer when you are away from your desk. The Gatekeeper creator, CoolCAD Electronics, sent me a unit all the way from US for my review. The package comes with a USB lock, the receiver key, keyring, 2x CR2032 batteries. The receiver requires only 1 battery which is rated to last about 3-6 months, while the other is a replacement. To start using the gadget, you have to pry open the back of the GateKeeper Key. Mine took a bit of effort to open: the Key case is secured by hook-catches all around, and one of them refuses to budge. The casing is already flexing precariously when I tried to use some force and I do not want to risk breaking the case even before I start using the GK-Chain. Finally, the hook gave way and freed the rear casing. After inserting the battery and snapping back the case, I was on my way. There is no power button for the Key, so if you decide not to use the Key for extended period, you have to remove the battery. To get the GK Chain to work on your mobile devices, install the GateKeeper Android iOS app (look for developer CoolCAD Electronics). Then follow the on-screen instructions to pair the Key. This will provide with the proximity feature to track your smartphones. This tracking feature can work without the USB Lock, but then you would have missed the star feature. 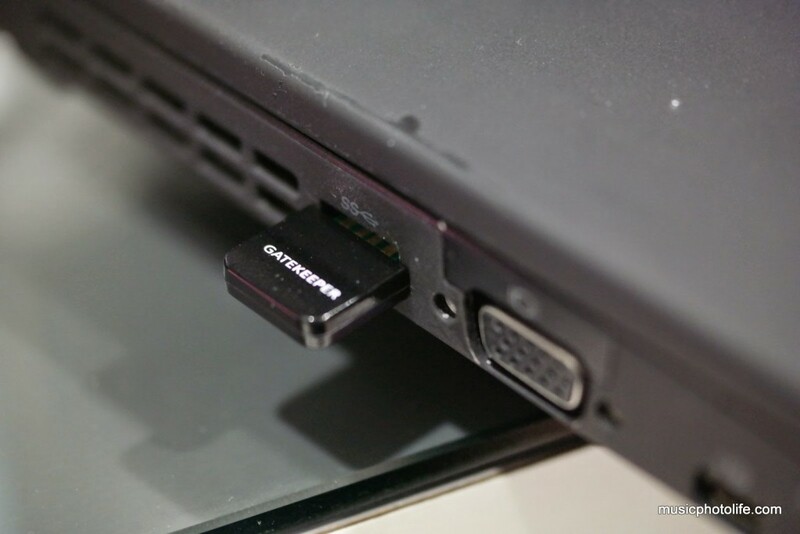 To get the USB Lock to work, insert it into the USB port of your computer, install the software downloaded from the GateKeeper website download page, register the Key with the USB Lock, adjust the lock distance and other settings. Check the online user manual for detailed steps. Simply carry the GateKeeper Key and walk away from from the computer. Moments later, your computer will automatically lock. When you walk back to the computer, the computer will automatically unlock. An alternative method is to disable auto-unlock, which means you would require the Key and a valid password to log on to your computer – 2-factor authentication. This is such a convenient feature for computer users who do not have the habit of locking the computer (although it is as easy as pressing Win+L) before leaving the desk. And even so, it may be a hassle to always re-enter the password when you are back at your desk. This device eliminates these repetitive yet important security task. Note that with the GateKeeper installed, it is not possible to manually lock the computer when you are at it. When you do, the USB Lock will detect your GateKeeper Key and auto-unlocks again. You also can remove the USB Lock any time and the computer will lose the auto-lock capability. During my review, the GateKeeper does not always work. Even when I am at my desk, the computer will occasionally auto-lock. Other times, when I return to my desk, it does not auto-unlock until moments later. This sporadic behaviour may cause irritation to consumers, and I hope this reliability can be fixed via firmware or software updates. As of now, the simple way to resolve the issue of the Key detection problem is to remove the USB Lock and log in normally. It would be good if the USB Lock does not stick out of the USB port, so that laptop users need not remove it during transportation. For this feature, there are a few ways to make it work. When the GateKeeper Key is paired to a smartphone, the smartphone will trigger an audible alert when the Key is out of range. You can also locate the Key via the smartphone app and the Key will make beeping sounds. I also find that you can pair multiple smartphone apps to the same Key. When testing the GateKeeper app across several smartphones, the proximity detection does not work consistently. I get the best consistent connection with the Sony Xperia Z3 Compact, intermittent on-and-off connection on the HTC One M8. On the Samsung Galaxy Note Edge, it worked initially, but after 10 minutes, the Key eluded the smartphone detection. Then, after an hour, the phone somehow detected the Key again, and remained connected since. I also find the Key alarm is relatively soft. The alarm is pleasant when placed in open area, like on the desk. But if you put the Key in your bag or your pocket, it becomes almost inaudible unless in a quiet environment. If the alarm cannot be easily heard, then it would be difficult to locate the Key if one wants to find it. It would be good if user can set the alarm volume to suit the needs. 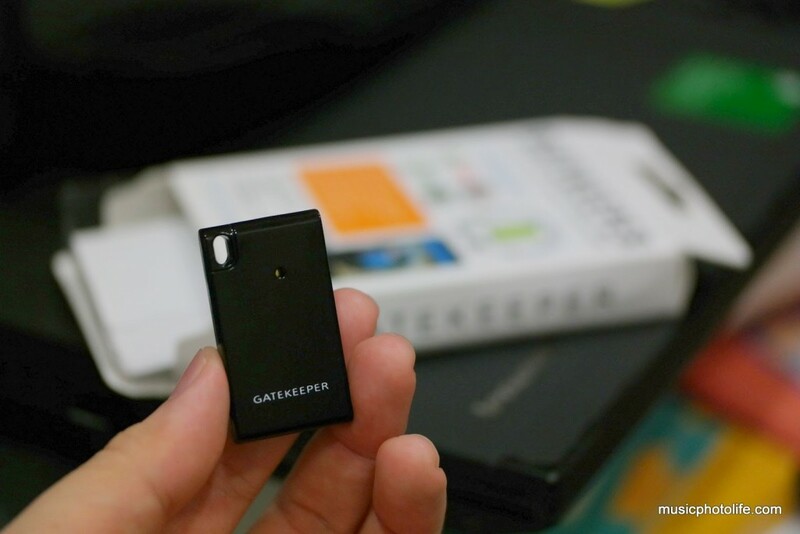 The GateKeeper GK-Chain with USB Key offers much-needed convenience to enforce computer security. If you value your privacy, this is a highly recommended product to automate the locking of your computer while you are away. The tracking of valuables feature does not work quite well with the smartphones I tested, but it’s a nice-to-have capability which I personally won’t rely on. The Protag offers a more comprehensive loss-tracking solution. Disclaimer: The products are provided for review without the need to return. Pingback: 2014 In Summary – Music.Photo.Life.